Leucadendron 'Ebony' is a sport of Leucadendron 'Safari Sunset' -a hybrid between Leucadendron laureolum and L. salignum. My experience has been that is slow growing but the rewards are magnificent. 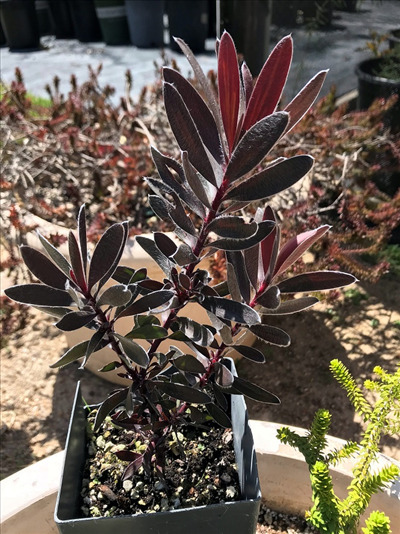 Black foliage with burgundy flush in winter-spring. Grows best in full sun. Very cold hardy at my nursery to 18F. Slow growing in containers grows best in well-drained soils. Propagation Information: Grown by cuttings. Patented PP23,258.